The American Chemistry Council (ACC) says that US chemical and plastics industry investment linked to plentiful and affordable domestic supplies of natural gas and natural gas liquids (NGLs) from shale formations has surpassed US$200 billion. Since 2010, 333 chemical industry projects cumulatively valued at US$202.4 billion have been announced, with 53% of the investments completed or under construction and 41% in the planning phase. Fully 68% of the total is foreign direct investment or includes a foreign partner. Project types include new facilities and capacity expansions. The ACC analysis shows that US$202.4 billion in capital spending could lead to US$292 billion per year in new chemical and plastics industry output and support 786,000 jobs across the economy by 2025. Robust supplies of NGLs, especially ethane, are key to the US chemical industry's competitiveness. NGLs are the main feedstock for basic petrochemicals and plastics in the US, while companies overseas mostly use naphtha, which is oil-based. Since feedstock comprises about 75% of the cost of ethylene production, lower prices favour US chemical makers in global markets. 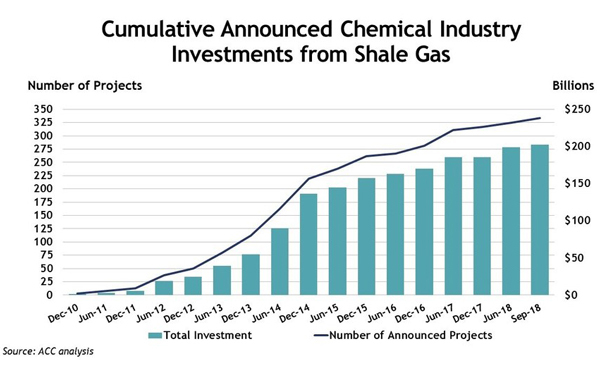 The latest report is an update to ACC's first report, "Shale Gas, Competitiveness, and New US Chemical Industry Investment – An Analysis of Announced Projects." Released in May 2013, the report analysed 97 chemical and plastics industry projects totalling US$72 billion in potential investment that had been announced as of March 2013.